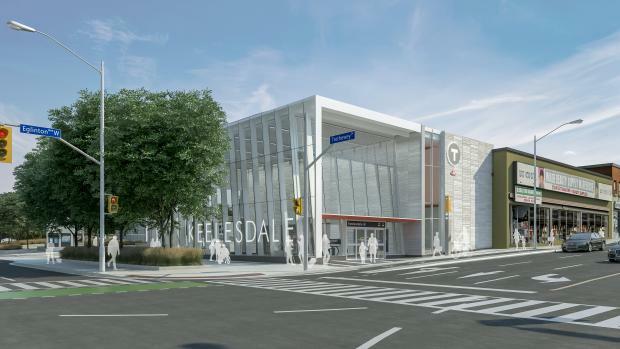 Keelesdale Station will be an underground station located at the intersection of Keele Street, Trethewey Drive, and Eglinton Avenue West. third– at the southeast corner of Eglinton and Keele. The station will include an off-street bus loop with four bus bays to serve TTC buses. There will also be on-street connections to TTC buses. There will be a station plazas at all three entrances. A station plaza is a landscaped public space outside of a station entrance that functions as an area where people can meet, gather, wait and/or relax. There will be 60 outdoor bicycle parking spaces. York Memorial Collegiate, at the northwest corner of Keele and Eglinton, is a Heritage Interest Building as designated by the City of Toronto. Noise attenuation walls will be built between the off-street bus stops and adjacent houses. Download the Keelesdale Station Backgrounder. Disclaimer: Renderings represent station design at a level of 90 per cent. Renderings are for illustrative purposes only and are subject to change.